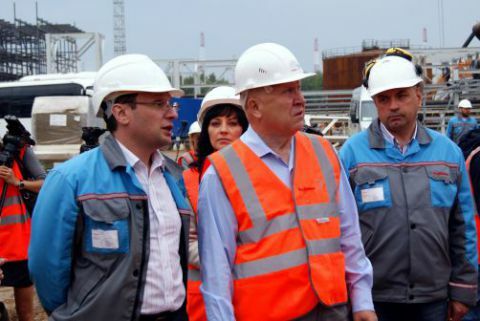 On Thursday, August 22 Governor of the Nizhny Novgorod region Valeriy Shantsev visited the construction site of RusVinyl LLC in Kstovo, Nizhniy Novgorod region and had an off-site meeting devoted to the construction status of the PVC complex, which is one of priority and strategically important projects for the region. During a construction site walk through Guenther Nadolny, RusVinyl CEO reported to the Governor about the overall progress of the project implementation which actually is about 90%, including construction works – 86%, engineering - 99,8% and delivery of equipment and materials - 98,5%. The start-up of the complex is scheduled for the year 2014. At several zones of the complex pre-commissioning and commissioning activities have already been started. Thus, in compliance with the temporary permit for commissioning works execution issued by Rostekhnadzor, RusVinyl’s main step-down substation was energized from Zeletsino substation of EES JSC. In compliance with the schedule approved, commissioning works and equipment testing shall be executed till the end of August. In September and October similar testing is planned to be executed at the in-plant substations of the electrolysis, PVC and VCM production zones. When all commissioning works are executed and Rostekhnadzor permits are received, RusVinyl power supply system will be put into constant operation. During the meeting the Governor hold also discussion of the issues related to implementation of infrastructural and service projects associated to the construction of PVC production complex.